The morning in Munnar was chilly. After having a light breakfast we left for the places towards Mattupetty Dam. We stopped at two-three places in our way. We stopped at Flower Museum where we saw a number of mesmerizing flowers many of which we did not see before. The pineapple outside the nursery was very tasty. We also stopped to see tea gardens running deep into the valley and snapped few pictures with those tea gardens in the background. After few kilometers, there was a place where tourist could enjoy elephant riding. Many tourists were trying that but we decided against that as we had to travel further. We reached Mattupetty Dam after that. It was a medium-sized hydroelectric facility, an important source of power. From the side where embankments were built, the dam did not provide very beautiful views but it was not built for that purpose. The reservoir had boating facility, both paddled boating and an electric one. The environment along the periphery of the reservoir was beautiful and peaceful. Driving along that we reached Echo Point, situated at the other end of the reservoir. The distance to opposite shore was not that great. The place has its present name because one can shout something and then he can hear the echo. Needless to say, we also tried that. Echo point had one factory outlet for locally grown and processed tea. After Echo Point, we went to Kundala Dam, Asia's first arch dam. 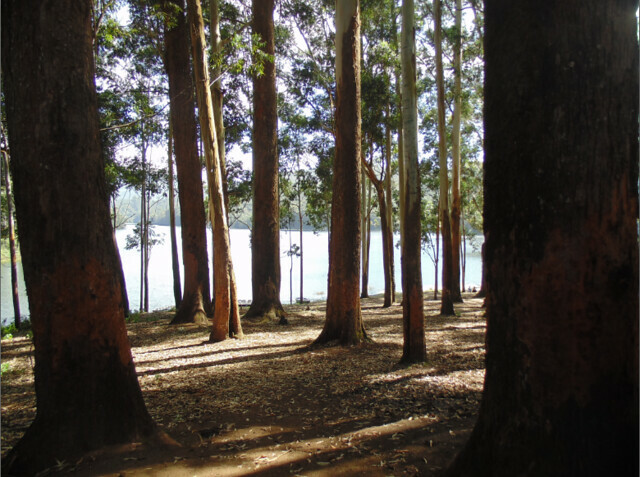 Certainly this was more beautiful than Mattupetty Dam, because of the lake's surroundings and dense eucalyptus forests. The dyke had few old machinery installed although their condition indicated that they were not being used. We sat on lakeside for some time and had coconut juice there. Next point was Top Station from where one can see the tea gardens and lake below. We returned to Munnar town after that and had lunch there. The final leg of our journey in Munnar was towards Thekkady. We planned to see places of interest and then proceed towards Periyar Tiger Reserve in Thekkady. The first viewpoint was Lockhart Gap, situated 13 km from Munnar. Misty valleys stood out among other sceneries. Power House Waterfalls was nearby. The entry near the waterfalls was locked with iron boundary so that the stream does not get polluted as it was used as drinking water in nearby areas. We also stopped at a factory outlet of tea. The owner of that shop told that nearby tea gardens were owned by Tata. At the outlet, we were surprised to see so many varieties of tea. There were lemon tea, strawberry tea, green tea, vanilla tea to name few of them and there were as many varieties of chocolates also grown in Kerala. At that shop, I came to know what is CTC tea. It meant Crush, Tear, Curl, an old method of processing black tea. The story of Munnar would be incomplete without the mention of its beautiful tea gardens. They were present everywhere in Munnar. By looking at them one might think utmost care must have been taken to maintain all the plants at the same height. All the hills were covered with tea plants but stills their slope patterns were left undisturbed. We stopped at few places just to go inside tea gardens and feel the natural greens closely. I even tasted the tea leaves, it had very different taste than the processed tea. If you see tea gardens from a place at high altitude, those hills will look as if they were placed just for tea gardens. It was so difficult to believe that those hills existed before tea plantation covered them. Driving down the hills while leaving Munnar for Kumily we could see Periyar river in the valley. The sight of tea gardens became so familiar that when we could not find them after leaving Munnar it felt that something was missing. Munnar was such a nice place that we felt fresh even after travelling for two continuous days. After travelling more than 80 km, we reached Kumily early evening. From there started the second leg of our trip - a visit to Periyar Tiger Reserve. See Dams, Waterfalls and Tea Gardens of Munnar, Kerala in Pictures also. Find pictures of Munnar, Kerala on Flickr here.